The United Methodist Church is at a crossroads. Some of us believe our differences are so great that it’s time to part ways. Others believe we must do all we can to remain united. Are We Really Better Together? suggests that our disparity of views is deeper than the issues of sexuality and marriage. 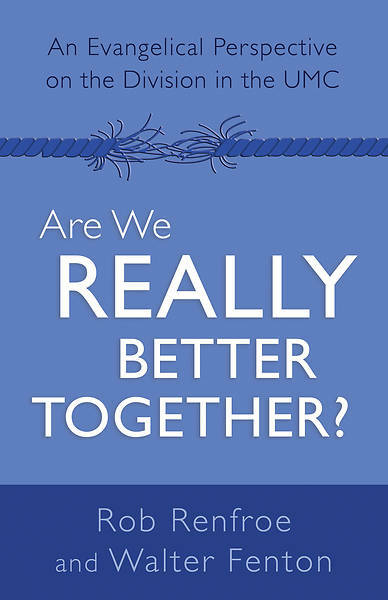 Authors Rob Renfroe and Walter Fenton take the stance that United Methodists need to make an honest admission that we are not together as a church if we are not together on issues as central as who Jesus is, the way we are saved, and the authority for determining the truth about God and his will. Their book is a thorough explanation of how they formulated their position and why they believe we should move forward with the creation of a plan that allows for a fair and amicable freeing of both sides to pursue what they believe God is calling them to do.